Yellow may not be your color, but you haven't lost your sense of humor. I'm still laughing over the yellow submarine the mermaid is trying to get rid of. I'd buy it if I lived closer! It's a gem and your digital skills always impress me. 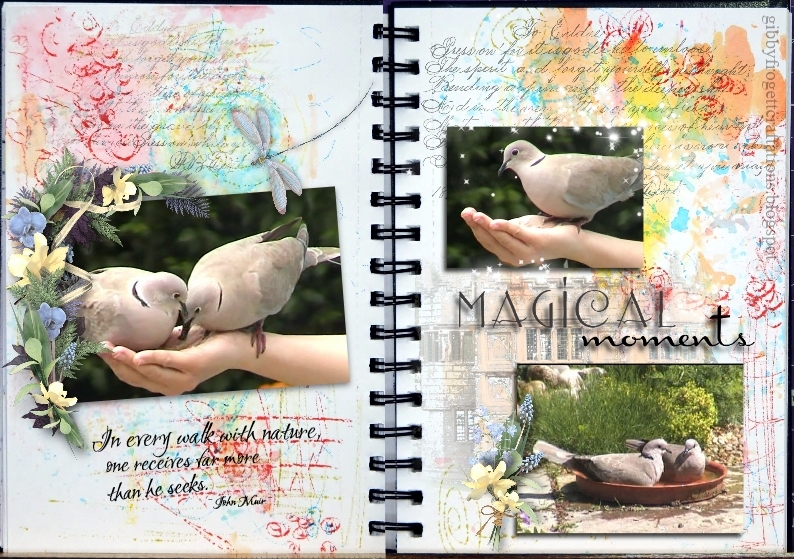 Thanks for joining us again with Rike's theme at Art Journal Journey, dear Gill. A fantastic page Gill. 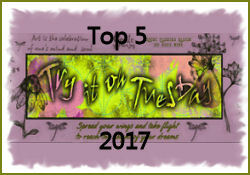 I love the bright colours and have a couple of popular songs floating around in my head after I read the post. The page is bright and happy to see. I smiled at the green fly on your T-shirt, my hubby would have laughed as well. Happy weekend wishes, I hope the winds don't get to bad, it is really wild here. What a funny page to cheer up the miserable wintry days - you made me smile! Your painting is gorgeous and your digital addings are very clever! 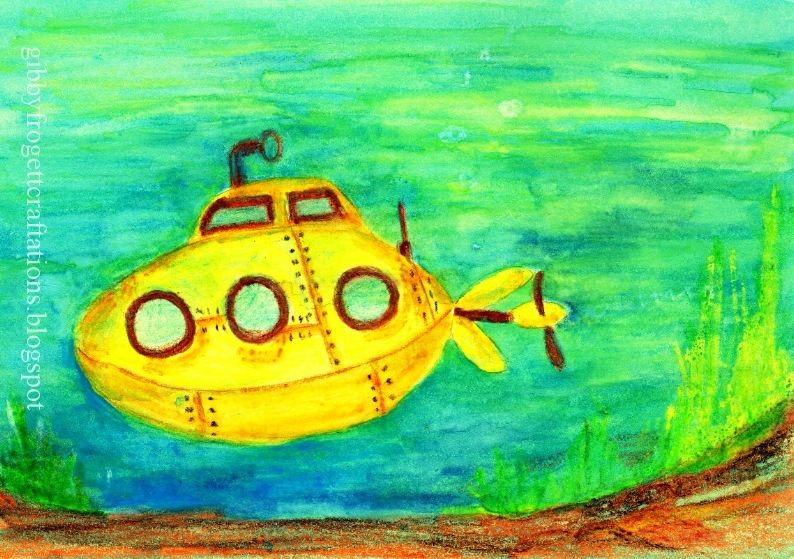 Now I see it's a yellow submarine (and not a duck, haha), you know what I mean. 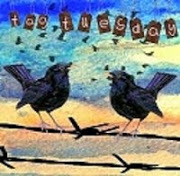 Thank you so much for linking such a fabulous piece to my yellow theme at AJJ! I appreciate it! Wish you a happy weekend, dear Gill! Simply perfect Gill! What a cheerful creation! I have to smile about thr green fly on your shirt -lol! I created something in yellow today and a mini fly sat down and obviously wanted to eat something of the yellow ...lol and I saw that the new fashion colour for this spring is also yellow...so many shirts and even skirts and dresses in yellow - that would never fit me... can't imagine that many woman can wear yellow. Happy weekend and thank you very much for supporting Rike with this amazing entry! The yellow submarine mobile home is marvellous, looks so cosy. 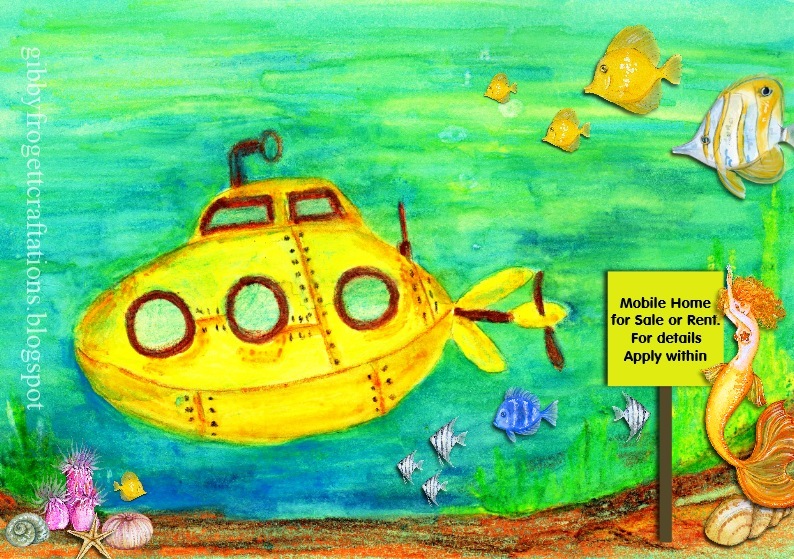 That's clever making the signpost and I think the yellow fish are giving it a good look. On second thoughts maybe they are saying "What in sea is that!" The blue fish is looking rather blasé, seen it all before. I haven't seen it before and I like it all very much, it's happy and fun. Your Yellow Submarine entry for Rike's AJJ theme is wonderfully creative; better than I could ever have imagined. I just love it, Gill! And I'll have to remember never to wear yellow while walking at the coast. 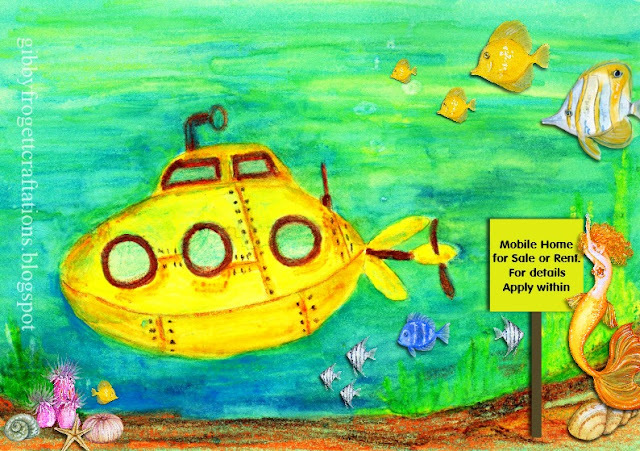 I adore your yellow submarine page Gill! Made me smile on this blustery morning! At least the sun is shining again today. Hope you've survived the storms with no structural damage.